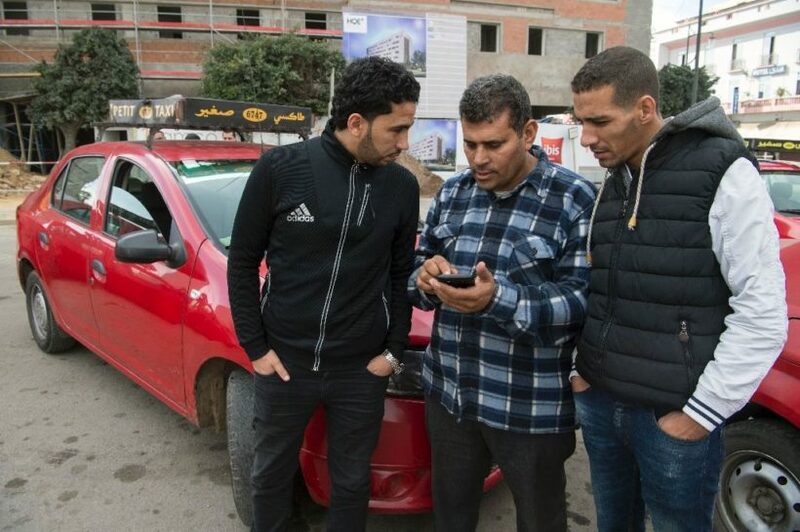 Moroccan taxi drivers (drivers of Casablanca's famous red cabs) check the Uber app as they wait for customers in Casablanca. (from Agence France-Presse) Casablanca, Morocco | Uber drivers in the Moroccan city of Casablanca last month…found themselves surrounded by irate local taxi drivers, who forced them from their vehicles and handed them over to the police, the latest in a string of protests in the kingdom against the…travel app. The taxi drivers posed as would-be passengers, flooding the app with requests before forcing the Uber drivers from their vehicles. “After the tramway, illegal drivers and now Uber, they are trying to kill us off,” said Abdelouahed, who works for a small local taxi firm. The recent opening of a new tram line in the city has also siphoned off some of the local drivers’ traditional clientele. “The tram has already eaten up an important part of our market, and things are getting worse with Uber, which operates without constraint,” said Abdelouahed. 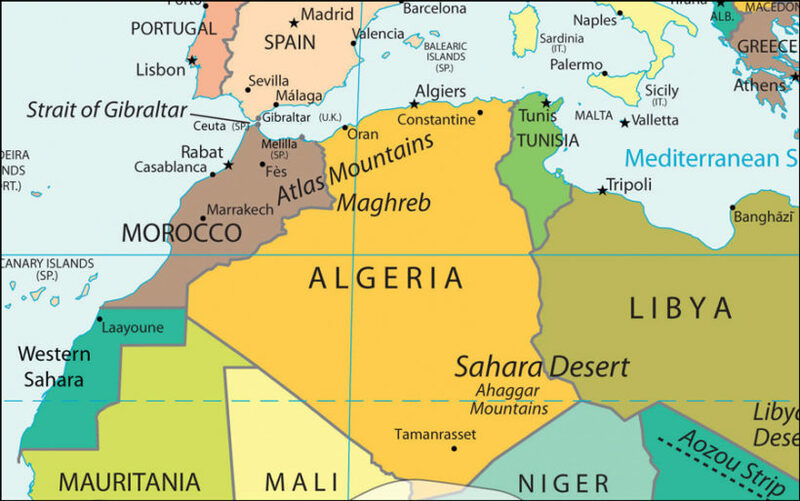 The management of taxis in Morocco normally falls to local government. The transport ministry has so far kept quiet as to why Uber continues to operate in the streets of Casablanca. Abdelmoughit Bouchaib, Secretary General of the National Union of Taxi Drivers, told Les Eco that a meeting with the city’s wali [governor] was held last year to discuss Uber’s alleged unlawful conduct, but nothing has come of it since. …Business has boomed for Uber since it launched in San Francisco in 2011. But the smartphone app has faced stiff resistance from traditional taxi drivers the world over, as well as bans in some places over safety concerns and questions over legal issues, including taxes. (by Olivier Monnier and Baudelaire Mieu, Bloomberg News) | Ivory Coast’s government and disgruntled soldiers reached a deal to end a two-day mutiny that paralyzed several cities in the world’s biggest cocoa producer, President Alassane Ouattara said. Following an extraordinary cabinet meeting in the commercial capital Abidjan, Ouattara told reporters on Saturday that he agreed to “take into account” the soldiers’ claims over the payment of bonuses and improvement of their living and working conditions. He didn’t offer further details on the agreement. The president called on the soldiers to return to their barracks for these measures to be carried out. 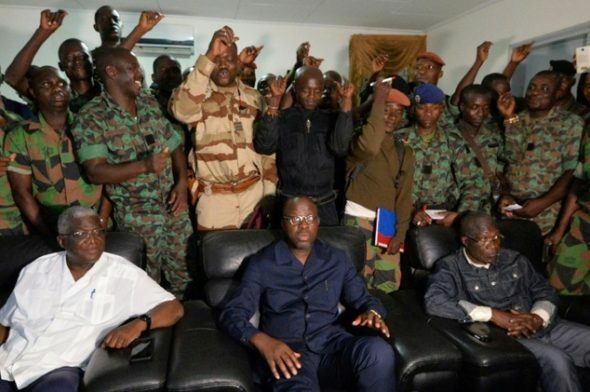 The agreement was reached after Defense Minister Alain Donwahi flew to Bouake, where the revolt began on Friday, and met with the disgruntled soldiers. According to the mayor of Bouake, Nicolas Djibo, he and the minister and about 20 other people were held for less than two hours on Saturday evening in a sub-prefect’s house by a faction of the soldiers who wanted more details about when they will get their bonuses and were seeking to be paid immediately. Gunfire erupted when the minister and other officials initially tried to leave the house, Djibo said. Later they were released, and the minister is returning to Abidjan, Djibo said. The revolt spread to Abidjan, the West African nation’s largest city, on Saturday. Gunfire erupted in a military camp on the eastern outskirts, and soldiers carrying semi-automatic weapons barricaded the main roads near the barracks and in other parts of the city, turning back motorists. Operations at the port of Abidjan were unaffected, Managing Director Hien Sie said by phone. The mutiny, the second since the president took office in 2011, spread to several towns in the interior, including Korhogo, Daloa and Man. The soldiers demanded higher wages, payment of bonuses and better living conditions, according to Donwahi. The president said he disagreed with the soldiers’ approach. “This way of making demands is inappropriate as it tarnishes the image of the country after all our efforts toward economic development and diplomatic positioning,” Ouattara said. Ivory Coast is emerging from a decade of crisis that ended in 2011, and economic growth has averaged 9 percent since 2012. 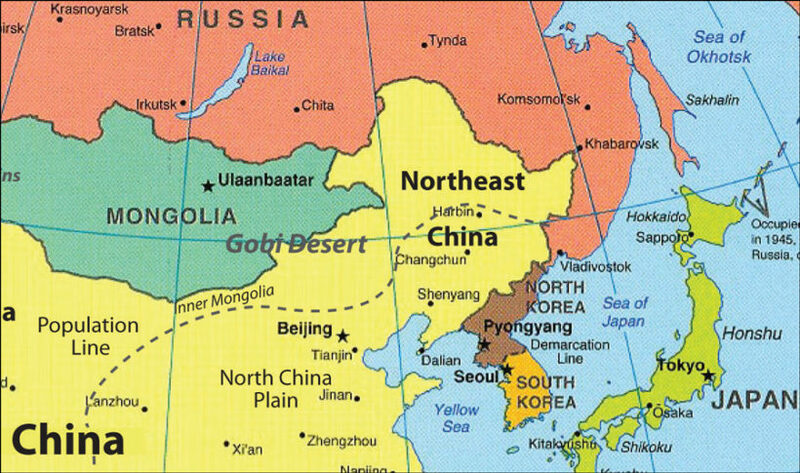 The nation’s economy is expected to grow 8 percent this year, according to the International Monetary Fund. 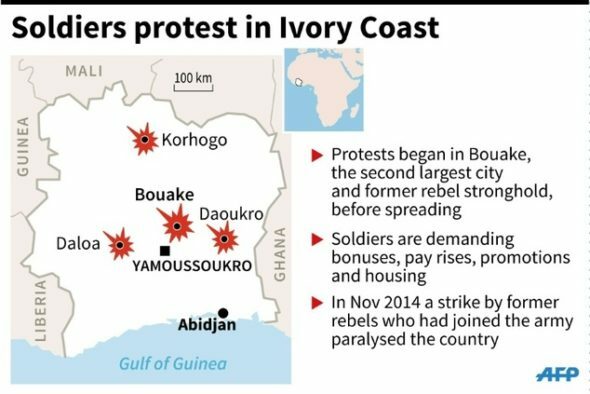 The northern half of Ivory Coast was controlled by rebels for almost a decade following a failed attempt to topple ex-President Laurent Gbagbo in 2002, with Bouake serving as their headquarters. Bouake is the nation’s second-largest city and is located about 340 kilometers (211 miles) north of Abidjan. 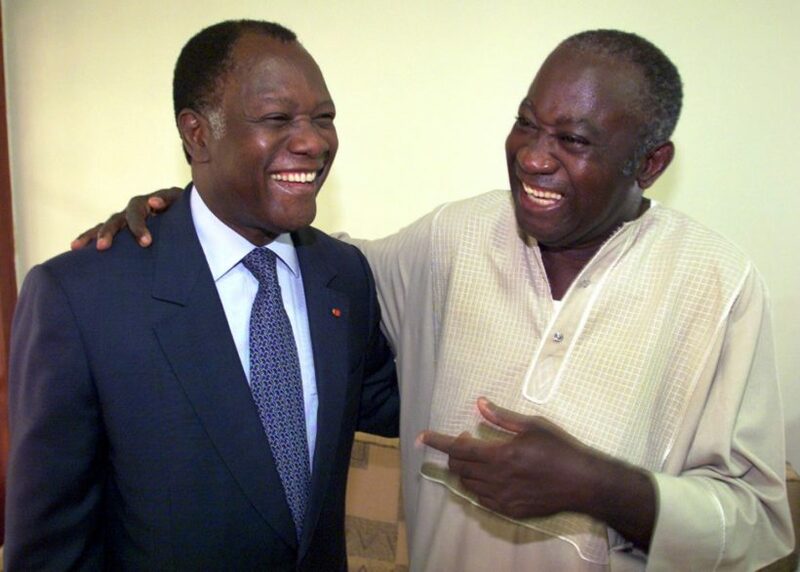 After five months of conflict following disputed 2010 presidential elections, the insurgents in the north joined loyalists in the south to dislodge Gbagbo from his residence and help install Ouattara, the winner of the vote, as president. The army is dominated by former rebel fighters, and programs to reorganize it have been slow to develop. 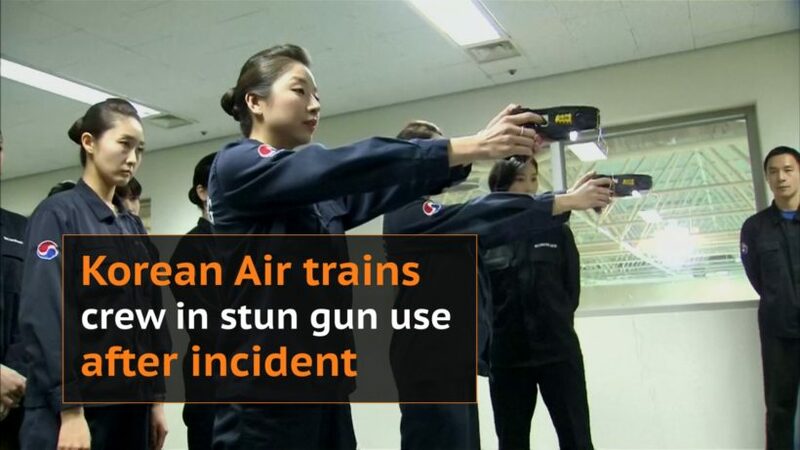 (by Hyunjoo Jin, Reuters) GIMPO, SOUTH KOREA |Korean Air Lines said it will allow crew members to “readily use stun guns” to manage violent passengers, and hire more male flight attendants, after coming in for criticism from U.S. singer Richard Marx over its handling of a recent incident. The new crew guidelines, announced on Tuesday, January 3rd, following the Dec. 20 incident, will also include more staff training, use of the latest device to tie up a violent passenger, and the banning of passengers with a history of unruly behavior. “While U.S. carriers have taken stern action on violent on-board behavior following the terrorist attacks of Sept. 11 (2001), Asian carriers including us have not imposed tough standards because of Asian culture,” Korean Air President Chi Chang-hoon told a news conference. “We will use the latest incident to put safety foremost and strengthen our safety standards,” he said. South Korean police on Tuesday, January 3rd, sought an arrest warrant for the passenger involved in the latest incident, identified by his surname Lim, on charges including inflicting injury to the crew and a passenger on the Vietnam to South Korea flight. The incident came to light when Marx said on Facebook and Twitter that he helped subdue “a psycho passenger attacking crew members and other passengers,” accusing crew members of being “ill-trained” and “ill-equipped” to handle the “chaotic and dangerous event”. Korean Air said it sent a thank-you letter to Marx’s management agency for helping control Lim. Korean Air was involved in a high-profile case of bad passenger behavior in late 2014 when the daughter of its chairman forced a flight crew chief off the plane at New York’s JFK Airport because she was unhappy about the way she was served macadamia nuts. The…incident provoked widespread ridicule and resulted in the executive, Heather Cho, serving nearly five months in jail. b) Why are the taxi drivers angry with the Uber drivers, who say they are just trying to make a living? c) Why have the taxi drivers taken matters into their own hands? Do you think this is a good tactic? Explain your answer. d) Do you agree with the way the local government has handled this controversy? Explain your answer. CHALLENGE QUESTION: What does the huge success of Uber in the U.S. (and around the world) show you about government regulation and the free market? b) What is the difference between a coup and a mutiny? c) Why did the soldiers stage a mutiny? d) Do you agree with the way the government resolved this crisis? Explain your answer. b) List all steps being taken by Korea Air to address the problem with unruly passengers. c) In South Korea, the number of unlawful acts committed aboard airplanes has more than tripled over the past five years, according to government data. Do you think the new guidelines will solve this problem? Explain your answer. d) One of the new measures is to hire more male flight attendants and to try to have at least one male on duty in the cabin for each flight. Do you think this is a good idea? Please explain your answer. Uber Morocco director general Meryem Belqziz insisted these were “isolated” incidents. “There were no injuries. It was more harassment,” she told AFP, admitting however that Uber drivers had been “shaken” by some protests. There are now more than 250 taxis working for Uber in Casablanca, Belqziz said, and the app has enjoyed 15,000 unique users in the last three months.